Okay, this is less of a tutorial and more of a ‘show and tell’ but you’ll have to excuse my excitement. Because this is just too easy and tutorials are really completely unnecessary. 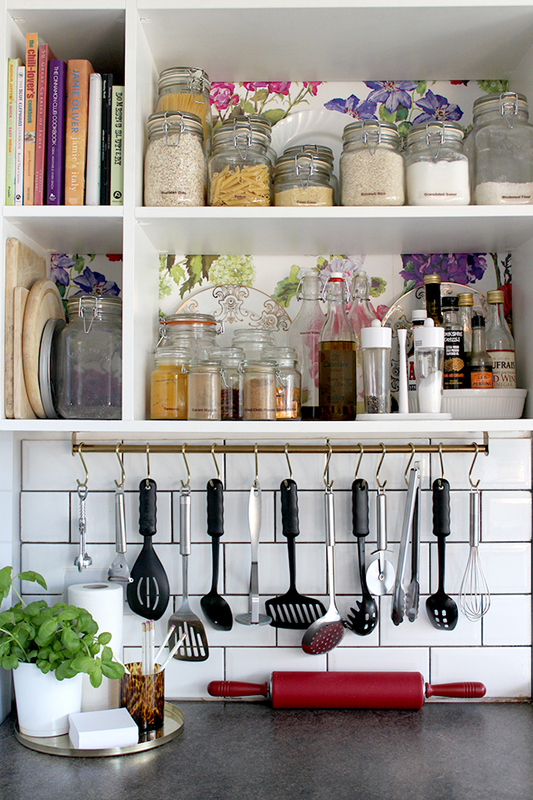 If you are familiar at all with my kitchen, you’ll know that I’m not adverse to ‘letting it all hang out’ – not that I am starkers when I cook (I mean, who wants hot oil splattered on their nether regions? ……… Oh wait, I suppose some people do) but no, no, it’s not that. It’s that I like SEEING STUFF. I know that there are many people out there who are what you might call ‘open storage adverse’ so if you are one of these people and you want to look away now, that’s completely fine with me. Everyone else, read on. 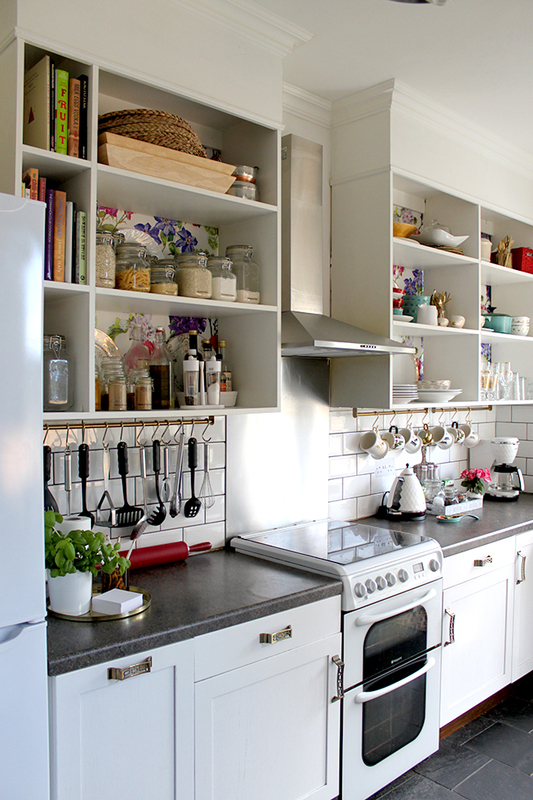 Now, as I said in my 2015 Goals post, I really want to go back to giving the kitchen the attention it deserves. The poor thing had a ‘good enough’ stamp stuck to it’s forehead about a year ago and it pretty much hasn’t changed much in all of this time. 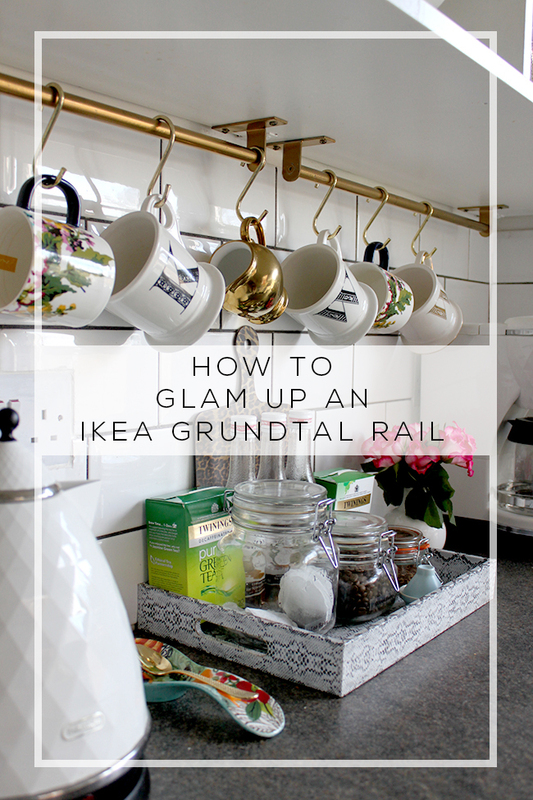 One of the things I’d been itching to do for AGES was to change the finish of the Ikea Grundtal Rails (just £4 each guys) where my mugs and utensils hang. I think they are supposed to be installed on the wall but I decided to hang them directly under the cupboards which gives them a slightly different look. 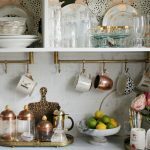 I’ve introduced a lot of brass and gold to the kitchen and while I don’t mind at ALL the look of mixed metals (I’ve certainly had it in here for a long time), I really do want to start considering bringing in more brass/gold and replace some of the chrome/stainless items. All I did was take down the rails, spray painted them with two coats of Montana Gold Gold Chrome, left them to dry for 24 hours and hung them back up. For those who need more details, here you go. I told you it was unnecessary. But my god, I love them. WHY DID I WAIT SO LONG? 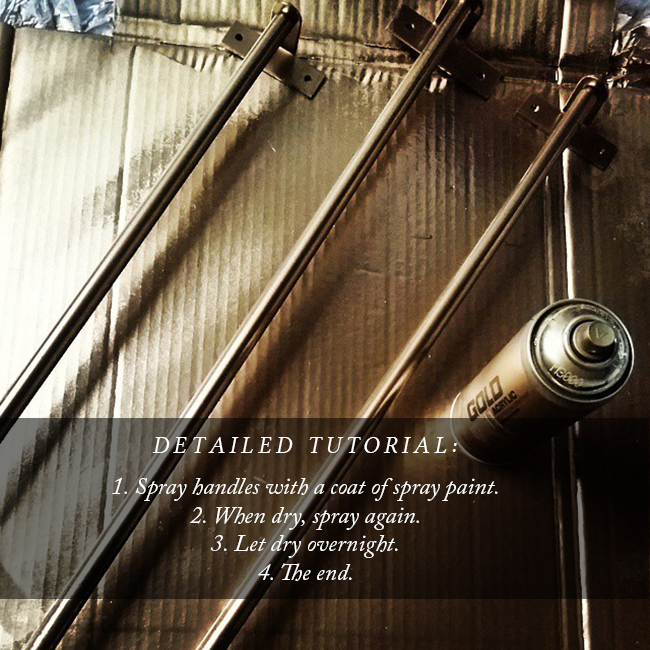 Now, I know this is not exactly a meaty post (“Ughhh sure, you spray painted something gold, Kimberly, that’s great, can we get on to actual real DIYs now please?”) but it’s SO effective that I hope you’ll excuse the fact this isn’t exactly rocket science. 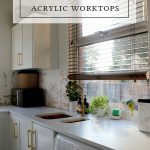 There are two other areas that I’m hoping we’ll be addressing rather sooner than later as well – that stainless steel cooker hood (extractor fan for my US readers) and the stainless steel splashback have got to go. It looked fine when we had a stainless steel cooker but now, I look upon it like some kind of demented King: “You no longer please me! Away with you! Off to the dungeon!” So I don’t have a dungeon but I have a few ideas so that’s good enough. The second thing I am desperate to address is the lighting. I get a lot of love for those pendants but the stainless steel ‘Industrial’ look is as far away from my style as it really gets and I just feel like they no longer ‘speak’ to the rest of the space. I am trying desperately to find something affordable I love but it’s been a little bit of a battle. Trying to find brass lighting that isn’t either very traditional or very industrial is absolutely IMPOSSIBLE in this country. I have actually wailed about this on Twitter but it doesn’t seem to have miraculously birthed a lot of lighting options for me out of thin air (not surprisingly). So I may be DIY-ing something in the future. I haven’t decided yet. In the meantime, here’s a little before and after action because you know how I love me a good before and after. Ahhh so much better, no? Recently redid my kitchen. Yes, my son installed high-hat lighting in ceiling which doesn’t particularly turn me on. However, what makes the lighting just perfect is subtle dimmable under cabinet lighting — can’t imagine my new kitchen without it! 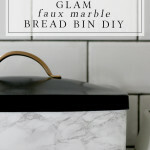 I’m tore up from the floor up about mixing metals and your kitchen looks spot on. 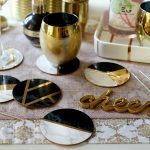 It’s a subtle enough change that really makes a statement and ties in with the brushed gold hardware in the rest of your kitchen. The devil is in the details. And this is giving me the right amount of inspiration! I got Robert a Nespresso machine for his birthday and I’ve been trying to style the damn thing into our kitchen. But I see you’ve a dedicated tray for such area. I am stealing this idea. Yes I am. It’s the little details! The rails look so perfect in gold! Gild all the things! Glorious if you asked me. 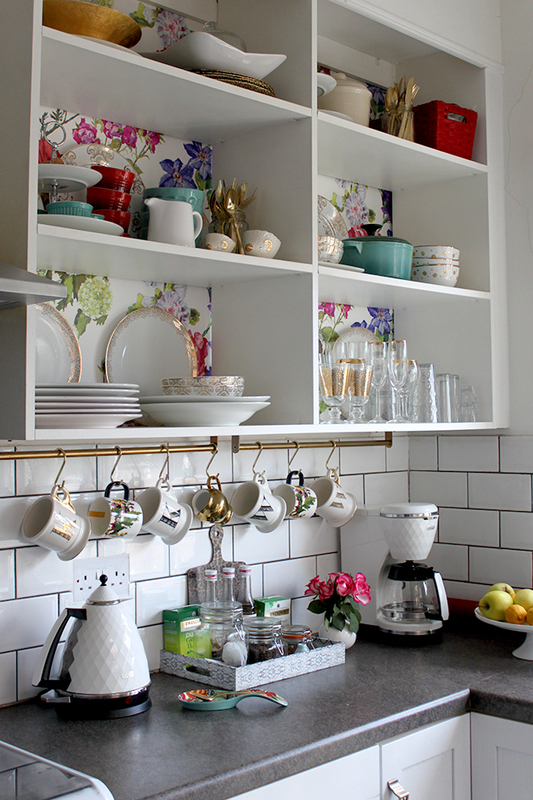 I love how bright and happy your kitchen is. 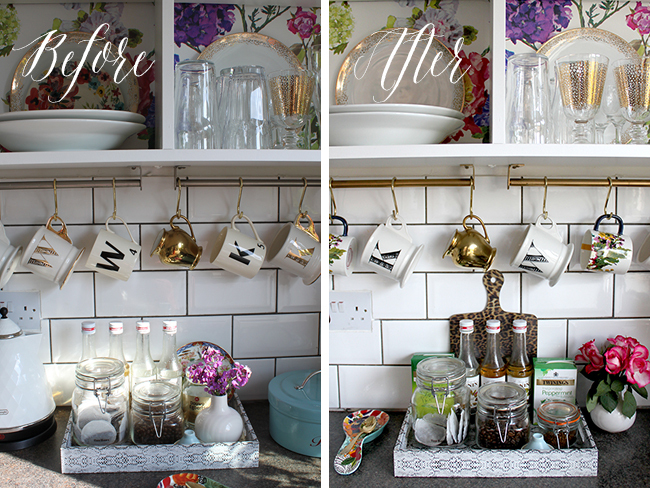 Sometimes the quick simple DIYs are the best – such an effective change! I love your open storage, but don’t know how you keep it so neat and pretty looking. So organised! I hope you find the right lights (although I’m very fond of the current ones!) – so frustrating when you can’t find what you want. I absolutely love how this looks!! 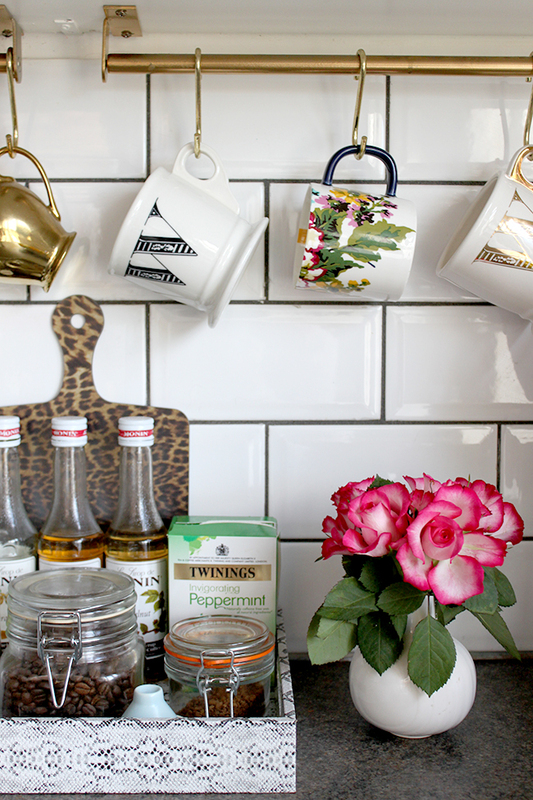 I am planning on doing the same in my kitchen! 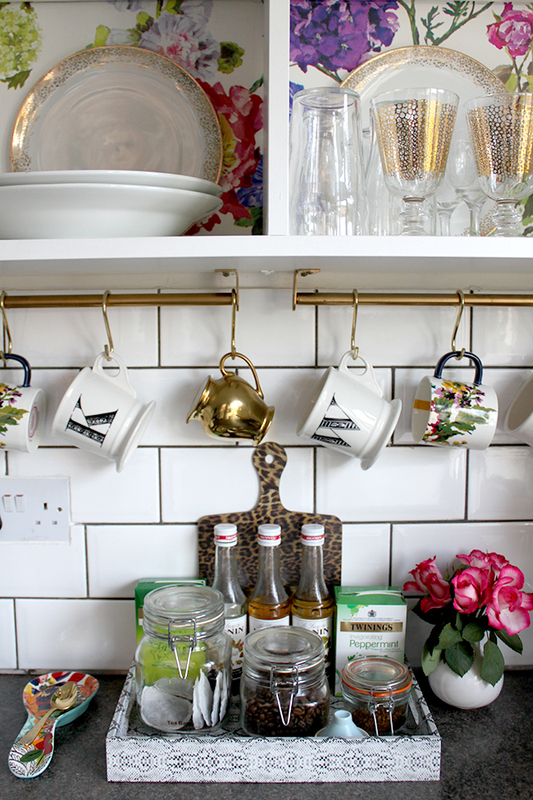 I was just wondering did you need to do anything special to hang the rod due to the weight of the mugs? Are just screws enough to hold that weight? Thank you so much for getting back to me! I am excited to try this in my own home! I will be installing this soon! Hi Kimberly….just wondering where you got the brass hooks from? Also has the spray paint lasted ok? I was worried the hooks moving around on it would eventually chip the paint. Anything I’ve ever sprayed gold (as I spray so much ikea stuff gold haha) has always ended up chipping. Maybe you know of a way to stop this!? Thanks! Although those are a little bit smaller than the ones I have (mine are 3.5″ and these are 3″ but they’d do the job!). Haha that’s hilarious! My husband never really gets it. I love my cushions neat or I feel stressed, yet he comes along and throws them all off into a pile grrr! That is a good idea yes! Thanks again! wow. Thanks for sharing the ideas. “this is less of a tutorial and more of a ‘show and tell’ “- I think you know how to play with words. Awesome…. 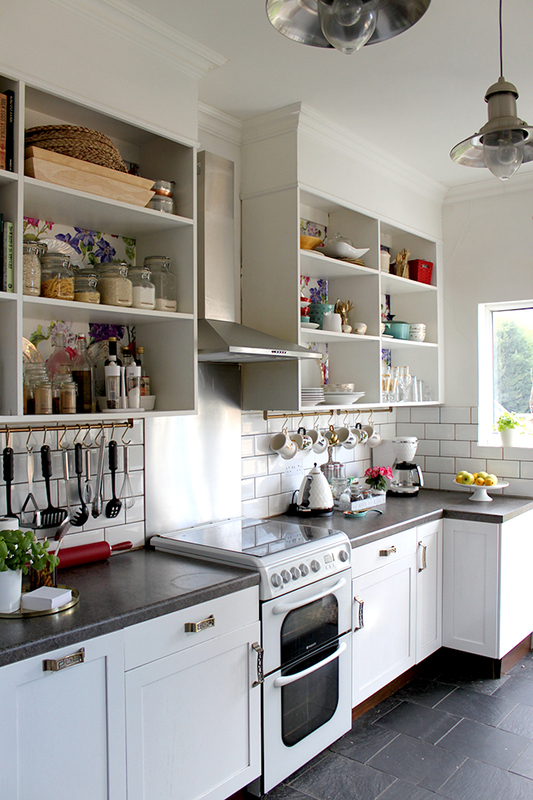 Can you tell me where you got the beautiful drawer/door pulls from, on your lower cabinets?